The lab report below was submitted as part of the coursework for CM1131 Basic Physical Chemistry. Please do not plagiarise from it as plagiarism might land you into trouble with your university. Do note that my report is well-circulated online and many of my juniors have received soft copies of it. Hence, please exercise prudence while referring to it and, if necessary, cite this webpage. Measure the rate of reaction for the hydrolysis of t-butyl chloride in two polar solvent systems – namely, water/acetone and water/isopropanol mixtures – by titrating the product HCl with NaOH. Observe and account for the change in reaction rates when different solvent systems are used. Calculate the corresponding rate coefficients for the hydrolysis reaction in different solvent systems. 2-chloro-2-methylpropane, commonly known as t-butyl chloride, is a colourless organic compound belonging to the homologous series of halogenoalkanes. It is a tertiary halogenoalkane as the carbon bonded to the chlorine atom is also directly bonded to three other methyl (-CH3) groups. As chlorine is more electronegative than carbon, it is electron-withdrawing, thus creating a partial positive charge (δ+) on the carbon atom and a partial negative charge (δ-) on the chlorine atom. Due to this polar nature, t-butyl chloride tends to undergo spontaneous solvolysis when dissolved in water. Solvolysisis a simple nucleophilic substitution in which the nucleophile is also the solvent. In the presence of polar water molecules, the C-Cl bond is broken and replaced by a C-OH bond. The products of this reaction are hydrochloric acid and 2-methyl-2-propanol. 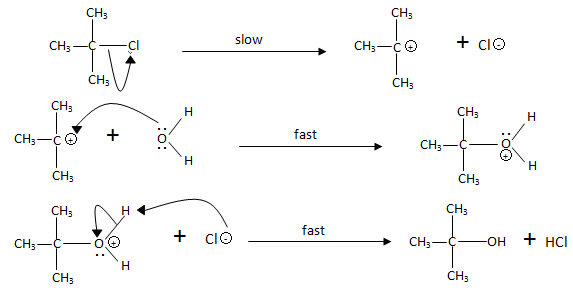 This is an example of an SN1 reaction as the rate determining step (RDS), or the slowest step in a series of elementary steps, involves only one molecule as the reactant. As such, the rate of the overall reaction is influenced by the rate of the unimolecular RDS. To initiate a chemical reaction, the reactant molecules must first possess energy ≥ activation energy. The rate of a chemical reaction is influenced by several factors, including the nature of the solvent. In this experiment, the effects of two different polar solvents on the rate of reaction will be investigated. To 50 cm3 of water in a stoppered bottle, 50 cm3 of acetone was added in. 1.00 cm3 of t-butyl chloride liquid was transferred into the stoppered bottle with a micropipette and the mixture was shaken. The stopwatch was started at the instant t-butyl chloride was added. The flask remained stoppered except when aliquots of the solution were removed for titration. Another mixture was prepared with acetone being replaced by the same volume of isopropanol. A 10.00 cm3 sample of the reaction mixture was removed using a pipette and added into a stoppered conical flask containing 50 cm3 of water. The mixture was left to stand for at least 90 minutes. The high concentration of water drove the reaction to completion. At every 15 minutes interval, a 10 cm3 aliquot of the reaction mixture was removed using a pipette and placed in an Erlenmeyer flask containing 15 cm3 of acetone to quench the reaction. 3 drops of bromothymol blue indicator was added to the flask, and the reaction mixture was then titrated against the standardized 0.04102M NaOH solution. When nearing the equivalence point, NaOH was added in a dropwise manner. The end point was a blue colouration that persisted for 10 seconds. The volume of NaOH used was then recorded. After the titration of all required samples (up to 90 minutes), the reaction mixture in the “infinity time” sample was titrated against the standardized 0.04047M NaOH solution in the same way. The volume of NaOH used was then recorded. From the above diagram, it can be observed that the graphs of ln([HCl]∞ - [HCl]t)against time for both mixtures produce a straight line. It can be concluded that both reactions follow a first-order trend. Since the gradient of the straight line is the rate coefficient of the reaction, the pseudo first-order rate coefficient of the 50/50 acetone/water mixture with t-butyl chloride is0.0224¬ min-1and that of the 50/50 water/isopropanol mixture with t-butyl chloride is 0.0356 min-1. To determine the order of a reaction, the rate law must first be derived in the form of differential equations, and then it can be integrated to obtain an equation involving concentration as a function of time. The hydrolysis of t-butyl chloride has been found to be an SN1 reaction, which means that only one molecule is involved as a reactant in the RDS. A proposed mechanism (as demonstrated in the next section) shows that the RDS is the formation of a carbocation intermediate from t-butyl chloride. Therefore, the rate of reaction should be proportional to the concentration of t-butyl chloride. Therefore, the graph of ln([HCl]∞ - [HCl]t)against time (t) will yield a straight line with gradient –k, with k as the rate coefficient of the reaction and ln[HCl]∞as the y-intercept. Maxwell-Boltzmann distribution curve shows that the more stable the reaction intermediates, the lower the Ea. This will favour the forward reaction and hence, result in a higher rate coefficient. Therefore at constant temperature, a decrease in EA will increase k, which means that the reaction rate will increase. According to literature, the hydrolysis of t-butyl chloride is an SN1 reaction. 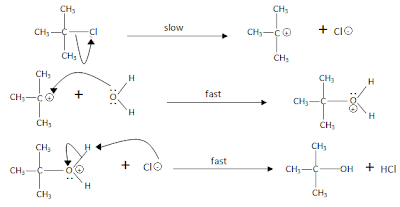 It is a nucleophilic substitution reaction where one reactant molecule is involved in the slow step, or rate determining step. The one reactant molecule involved is the one being hydrolysed, which in this case is t-butyl chloride itself. Another form of nucleophilic substitution is SN2 reaction, which means that two reactant molecules are involved in the rate determining step. For such a reaction, the two molecules are the halogenoalkane and the attacking nucleophile. The hydrolysis of t-butyl chloride is more energetically favored as an SN1 reaction than as an SN2 reaction. This is due to steric hindrance caused by the 3 bulky methyl groups adjacent to the central C atom bonded to the chlorine atom; therefore the nucleophile cannot access and attack the electron deficient C atom effectively in an SN2 reaction. Moreover, in an SN1 reaction, the intermediate carbocation is stabilized by 3 electron-donating methyl groups surrounding the C atom, thus alleviating the positive charge on it. This occurs by hyperconjugation3which is the interaction of the C-C sigma bond electrons with the adjacent empty p-orbitals of the central carbon atom, thus supplying electrons to the electron-deficient central carbon atom to stabilize the strong positive charge. Hence, an SN1 reaction is favored. SN1 reactions in which the nucleophile is also the solvent are commonly called solvolysis reactions. In this experiment, water is both the nuclophile and the solvent. Solvent as the nucleophile makes kinetic order indeterminate (pseudo-first-order because [solvent] is ≈ constant). From calculations, the reaction rate for the 50/50 water/isopropanol mixture is higher than the reaction rate for the 50/50 acetone/water mixture, as the k coefficient for the former is larger than for the latter. Both isopropanol/water and acetone/water are polar solvent systems. The polarity of the solvent affects the rate of the reaction through the solvent effect. The solvent effect is the interaction of the solvent molecules with the carbocation intermediate to stabilize it. The solvent molecules orient around the carbocation so that the electron rich ends of the solvent dipoles face the positive charge, thereby lowering the energy of the ion and favoring its formation4. Therefore, the more polar the molecule, the stronger interaction it can have with the carbocation, resulting in a more stabilized carbocation. According to literature, the polarity of a molecule is indicated by its dielectric constant. The higher the dielectric constant, the more polar is the molecule. The dielectric constant for acetone at 25oC is 20.7 and that for isopropanol at 25oC is 18.35. According to these values, acetone is a more polar solvent than isopropanol, and so should accelerate the hydrolysis of t-butyl chloride better than isopropanol. However, given the experimental results, this is not the case. Hence another factor needs to be considered – whether the solvent is protic. Isopropanol is a polar protic solvent as an H atom is bonded to an electronegative O atom, and therefore is able to dissociate to form H+ ions. Acetone is a polar aprotic solvent as all its H atoms are bonded to C atoms and are unable to dissociate. A polar protic solvent will not only stabilize the carbocation intermediate as mentioned in the paragraph above, but it will also stabilize the leaving group, which in this case is the negative Cl- ion. With isopropanol as the solvent, theCl- ions formed from the heterolytic C-Cl fission of t-butyl chloride are solvated by electrostatic interactions between it and the partially positively-charged hydrogen of isopropanol, stabilizing the Cl¬- ions. This interaction is known as hydrogen-bonding. This stabilization of both the carbocation and the leaving group further brings the activation energy down, and increases the rate of reaction. On the other hand, as acetone is a polar aprotic solvent, it is unable to stabilize the Cl- ions and so could not lower the activation energy further. Hence, isopropanol speeds up the hydrolysis reaction better than acetone, which is in agreement with the results of this experiment. While titrating, the conical flask has to be swirled constantly throughout to ensure that the contents are mixed evenly. Also, some titrant may drip onto the sides of the conical flask and may not react with the solution in the conical flask. This reduces the accuracy of the results as extra titrant would be used to achieve the equivalence point. To prevent this, deionised water can be used to wash down the unreacted titrant when nearing the equivalence point and the conical flask should be swirled before continuing with the titration. To achieve consistent results, one important factor is to add in the titrant in a drop wise manner before the equivalence point. Deionised water was used for washing the apparatus, instead of using tap water. This is because deionized water is pH neutral and will not negatively affect the results of the acid-base titrations. This is important as acid-base titrations are pH sensitive reactions. Other factors that would affect the accuracy of the results include parallax error when taking the readings and making sure that no air bubbles are present within the pipette and burette while titrating. Bromothymol blue is a chemical indicator for measuring substances that would have relatively low acidic or basic levels (near a neutral pH), i.e. weak bases as well as weak acids4. With the use of bromothymol blue indicator, the course of titration stops when the blue end point persists for ten seconds. However, the blue colouration may turn back to its initial yellow/green in HCl. This is because the acetone added to the aliquot before titrating only stops the hydrolysis of tert-butyl chloride by a large amount and not completely, hence HCl is being produced gradually and the concentration of HCl increases. Despite this, since there is only a very small amount of HCl being produced, we can regard the end point to be the blue end point that persists for ten seconds. If the blue colouration disappears within ten seconds, the amount of NaOH used to neutralise the HCl is insufficient and more NaOH should be added. To see the colour change at end-point more clearly, a blank piece of paper may be used as background screen while titrating. To increase the accuracy of the experiment, multiple titrations can be carried out until duplicate determinations agree to within 0.05mL of each other. This ensures that the results are not once-off outliers. By averaging the two most consistent and accurate results, the probability of incurring random errors was accounted for and decreased. The volatility of acetone and isopropanol causes the reaction mixture to evaporate. When removing aliquots of the reaction mixture, some of the acetone/isopropanol evaporates intoair and thus result in an inaccurate reading. To minimize errors, the pipetting should be done as quickly as possible so as to reduce the amount of solvent lost. As the compounds are volatile and hence, hazardous to health, the experiment should be conducted in a fumehood. Instead of manual shaking of the flask during titration, a magnetic stirrer may be used to ensure uniform and consistent stirring. The rate of reaction is dependent on the nature of the solvent systems. Since the reaction is a SN1 mechanism, the forward reaction would be favoured by a polar protic solvent system which would stabilize both the reaction intermediate and leaving group.